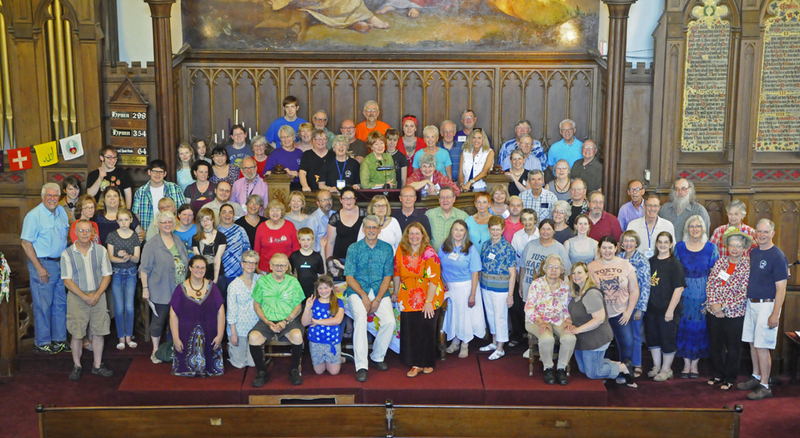 A Congregation photo taken June 11, 2017, at the Flower Communion Service. We are "The Voice of Liberal Religion of the Mid-Ohio Valley." 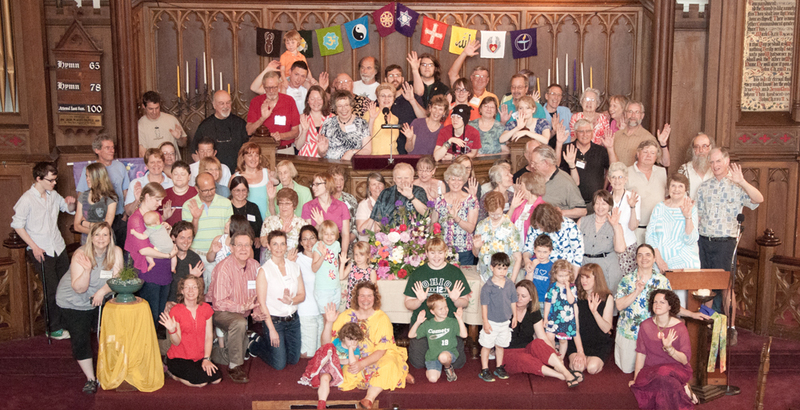 We are a typically UU-diverse congregation of about 130. We are scientists, engineers, teachers, doctors, lawyers, writers, social workers, civil servants, artists, unemployed, homemakers, professors, and more; We are humanists, spiritualists, christians, pagans, theists, atheists, and others: each of us seeking truth and meaning; all providing the comfort and nurture of community to all. 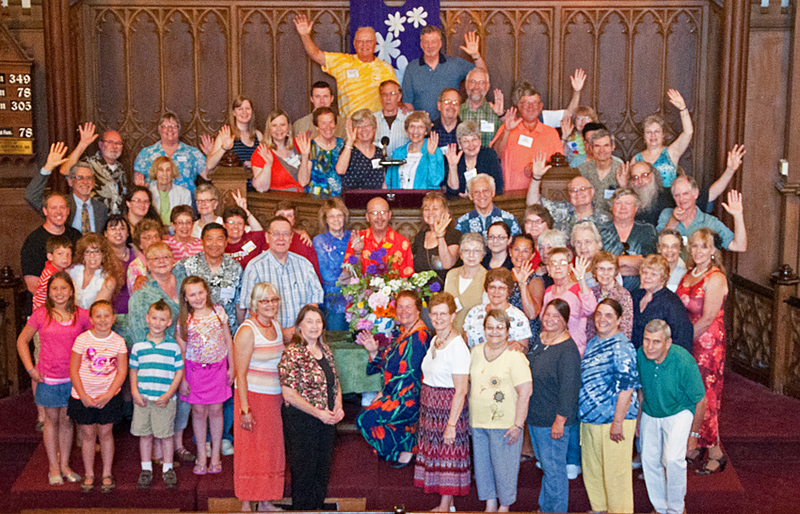 In keeping with our Unitarian Universalist principles, we strive to be a congregation that truly welcomes all persons, and we commit to structuring our congregational life in ways that empower and enhance everyone's participation. We strive to embody what we hope to see in the world -- a just and loving humanity; a community where people are free to be themselves, fully and without fear; a community where no one is exiled, silenced or exploited for reasons such as age, racial or cultural identity or national origin, gender expression or identity, sexual or affectional orientation, familial structures or relationship status, range of physical and mental ability, education or socioeconomic status, religious background, or political perspective. We welcome all to share in the fellowship, worship, responsibilities, leadership, ministry, blessings and joys of our congregation's life. It takes a lot of people for a religious community to function. Everyone in fact, has a ministry to all others, in our view. But there are certain people who occupy positions of note: Our professional Minister is Rev. Kathryn (Kat) Hawbaker. More information and a photo can be found on the Minister page. We are governed by a Board of Trustees that consists of Shari Miller (President), Dawn (Michelle) Wilson (Vice President), Katy McDaniel, Paul Dunn, Willa O'Neil, Emily Keller (Secretary), and George Banziger. Other key staff persons are: Treasurer: Linda Lawton; Church Administrator, Chris Keller; Newsletter Editor, Adeline Bailey; Webmaster, Ralph Olander; and Pianist, Randall Kidder. We are a member congregation of the Unitarian Universalist Association, whose offices are located in Boston, Mass. The UUA is divided into districts; we are a part of the Ohio-Meadville District (OMD) which encompasses an area spanning eastern Ohio, western Pennsylvania and West Virginia.